Mashed potatoes have got to be one of the ultimate comfort food side dishes. So, so good. Creamy carbs? Now it’s a holiday! This is about the easiest EVER way to make mashed potatoes. The only way it could get easier is if farmers/food scientists could create some kind of self-peeling potato. I don’t know if I would ever eat that as it sounds INSANE. But I would sure be tempted. Maybe for Halloween next year I should be a mad food scientist. Which would pretty much be a mad scientist who is holding a bag of potatoes all night. Or maybe that was the worst idea I’ve had this week. I’ll never tell. Oh, this totally feeds a crowd. Look at the giant pie pan of mashed potatoes! Don’t make this amount for just you and your significant other, or you’ll be eating mashed potatoes for a week. Slow Cooker Mashed Potatoes, serves 6-8+ as a side dish. First peel and cube the potatoes. Throw them in the slow cooker with the vegetable stock (or water) and butter. Cut the butter into small cubes before adding. Cover and cook on high for 4 hours and 30 minutes. Once the cook time is up, mash the potatoes. I used a potato masher. You could also use an immersion blender, potato ricer, etc. But I think the masher is the easiest option. Add the sour cream and milk and stir to combine. If it still seems too thick to you, add more milk until you get the consistency you prefer. Taste and add as much salt and pepper as you think it needs. Add the sour cream and milk and stir to combine. If it still seems too thick to you, add more milk until you get the consistency you prefer. Taste and add as much salt and pepper as you think it needs. Top with chives before serving, optional. Ah these sound amazing! I’ve been experimenting with making mashed potatoes on my own and I love the throw it in a pot and walk away method! (AKA minimal effort). For meat eaters, I recommend stirring in some bacon bits and cheddar cheese. Don’t use an immersion blender! 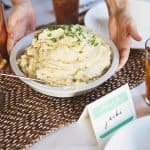 I tried that once and it made the potatoes gummy (http://www.thekitchn.com/food-science-why-mashed-potato-89228). This slow cooker recipe looks too darn tasty to ruin with an immersion blender! Honesty time: I’m always making boxed mashed potatoes. I don’t think I’ve EVER made them properly, from scratch… One of my goals for the next year (on my 26 things to do before I turn 26 list) is to make more thinks from scratch instead of making everything from a box (aka most of what I eat). I think this would be a great starting point and it would also allow me to dust off the old slow cooker, haha! Thanks for this! We have been trying to figure out what items we can make without the oven/stove top this year to stay out of each others way! Using the crock pot is such a great idea! It leaves an extra space on the stove and would keep the potatoes warm until you’re ready serve. Yum! Mashed potatoes are my favorite! Would this work with sweet potatoes d’ya think? If I read your guys recepts and ideas, I think every time again: “I really have to cook more!” So great! That really sounds interesting. Best wishes and a nice evening! Is there some advantage to this I’m missing? Potatoes aren’t difficult. Cooking them in a crockpot just seems like taking a longer road to the same place. Also have you tried using a stand mixer to mash your potatoes? They come out perfect and it takes seconds. My mom always makes it in the pressure cooker. SO GOOD. I always make my mashed potatoes in my kitchen aid the day before (I just add more milk than usual because they thicken a lot) and then transfer them into my crock pot, but I never thought of actually cooking my unmashed potatoes in the crockpot. Brilliant! I don’t own a slow cooker and have never used once (it’s not a very common appliance in my country), so I’m wondering if it really makes any difference to regular boiling… 4 hours is a looooong time for mashed potatoes, so is it really that much of a difference? There’s nothing wrong with leaving the peels in the mashed potatoes. The peels are so nutritious and it’s a shame just to throw them away. 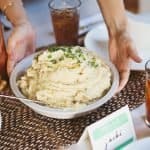 As someone who absolutely loves potatoes, and also someone who is constantly looking for new slow cooker recipes to try, I am ridiculously excited to try this recipe. Oh yeah, baby!! That is one serious looking dish of mashed potatoes! We just bought a slow cooker so I am going to give some mashed potatoes a whirl in it. I love mash potatos with lemon and sweet corn- this looks like a great recipe! wow these potatoes look absolutely amazing! Is there some trick to this I’m missing? I tried crockpot mashed potatoes once before, and it just turned into this paste-like consistency. My husband wasn’t a huge fan of the leftovers either, but that could be partially from the garlic. I tried this again today because I’m having some pregnancy-induced food issues and mashed potatoes are one of the only things I’ve been able to stomach, and the same thing happened. It could be partially because I used an immersion blender, as Lindsey said above, but the color’s all off too. I love this idea, but I miss the fluffy white potatoes that I get when I do the stovetop/Kitchenaid technique! how did i never think of this?!?!? omg it looks amazing! Thanks for the tip Lindsey! I bet it would. My guess is you may need to adjust the cook time… possibly. If anyone has tried it let us know! Good tip on the stand mixer. I’ve never tried that but sounds pretty simple, so thanks for sharing. The main advantage is freeing up your stove top space. Also, you don’t have to keep an eye on a slow cooker the same way you really should a stove top item. And this can be a big advantage on a day where you have lots going on in the kitchen (like turkey day). The taste is not that different at all-the big advantage is freeing up stove top space for other dishes if you are cooking a lot in one day (like we do for Thanksgiving here in the US). Yes, you can absolutely leave the peels in. It changes the texture but I have heard many times, like you say, that the peels are quite nutrias so that’s a great tip. Thanks for sharing! Hmm. I think you’re likely correct about the immersion blender. Although I’m not totally sure. But I also wanted to leave a comment to say I hope you’ll feel better soon! I’ve had a number of friends with different pregnancy-induced food issues, so heart goes out to you. And big CONGRATS to you and your growing family! You also free up a pan! I only have one stock pot and this will really help me come Thanksgiving when cookware is at a premium. this recipe looks delish, thanks for sharing! ooh! I’ve made baked potatoes in the slow cooker before (just wrap them in foil whole) and I loved them, but I haven’t made mashed. On the list to try. I never would have thought to cook potatoes in a crockpot. It’s genius really. Thanks for sharing! Those look absolutely delicious! What? Why have I never thought of this before??? So brilliant! I am tasked with the potatoes this year! This may just by my go to! Thanks!! So since it’s high for 4 hours, does that mean you could leave it on low for 8?? I love slow cooker meals! What a great way to make mashed potatoes! Tried this on Thanksgiving and despite following instructions to a T, these didn’t work! Potatoes were still hard after 4.5 hours on high and we had to boil them on the stove after the slow cooker. We managed to save them but sheesh! Thought it would be super easy and it was stressful! On the other hand, I also made your recipe for jalapeño popper dip, which turned out awesome and was a total hit! Well, I’m sorry that stressed you out on Thanksgiving day! Boo! Appreciate you coming back with your honest review. I sincerely love getting crowd soured recipe testing from you guys-you’re the best! I used 5 lbs of russet potatoes as suggested in the recipe and cut them in to chunks that are the same size or smaller than pictured. I do have a less fancy slow cooker (same brand) that is about 10 years old. It only has three settings — off, low and high. It may not have the same high temp settings as yours, which would be the issue! I used high and after 4.5 hours, potatoes were still hard as rocks! Not sure what I did wrong! I actually had a friend that also tried this and she had the same problem as me…she left them going in the slow cooker and it took 8 hours for hers to be soft enough for smashing! I just made these today for Thanksgiving and they were ah-MAY-zing!